Are you thinking of building a log cabin? If so, you’re probably looking at all of your options, and you’re trying to find not only the most affordable option but the best quality option too. These small log cabins from Wayside Lawn Structures are great for that small backyard guest house, kids playhouse or a small log cabin. The company is located in Columbiana, Ohio, and they serve the Tri-State area of Ohio, Pennsylvania, and West Virginia. 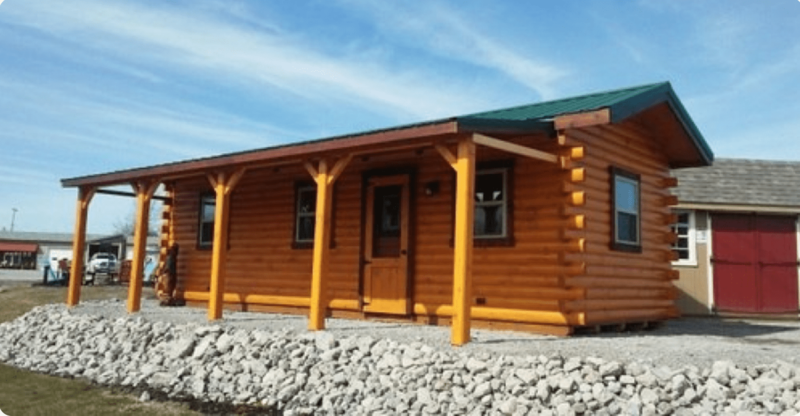 The Hunter Log Cabin is one of the many real log cabins for sale from their website, and it includes 4 by 6 high-quality logs that you will need to build this sweet log cabin. The small log cabins packages come with everything needed to build the structure you see in the photos. 5/12 pitched roof, shingles or a steel roof with a 30-year lifespan, 2-inch tongue and groove hardwood flooring which can be white pine or treated. The package also comes with 6 single pane windows and the entrance door which can be either steel or wood. These prices of the small log cabins also include a loft area built within the cabin, and all of the logs are stained with Perma-Chink. For the price, you could have yourself a very sweet cabin at a pretty great price. Building a log cabin kit like this one usually doesn’t take too long either, and most people say one this size could be built in a weekend with the help of a few people. So if you are looking for the right simple small log cabin at the right price, Wayside Lawn Structures might just have what you want. They have been building small log cabins and buildings since the spring of 2002, and they are the area’s leading supplier of log cabins and backyard structures. They also make playsets for children, gazebos, storage spaces, wooden and poly outdoor furniture, vinyl pergolas, wood decks, and wood fences. The company has gotten a ton of great reviews for their building work, and they are passionate about creating the perfect building for each customer that comes their way. The other great thing is they offer a 30-day money back guarantee on all of their products except for custom items which need to be ordered through a representative. As you can see, the small log cabins from their log cabin gallery are all built with logs. The cabins are built with high-quality tongue and groove logs, and you can choose from white pine, white cedar and red cedar wood for your logs. They use foam weather stripping, and they are insulated. They are built with D shaped logs with a single tongue and groove which gives the cabin thermal value. Customers can also add in rigid insulation board in the floors and the roof to insulated it even more, or they can get vinyl thermopane windows which would make the cabin retain heat better. This would make for more efficient heating and cooling for the cabin. Plus since it’s already pretty small, this makes it even easier to heat and cool. If you want a tiny house on wheels, they even offer the Pioneer cabin on wheels which looks so cute. This would make for a great guest house or a nice rental unit to use as a bed and breakfast. Some of the smaller units can be used as a kids playhouse as you can see in their great photos on the website, but they also can be used for home offices and recreational cabins as well. The largest prebuilt unit they can deliver to you is the 12 foot wide by 32-foot long cabin. You could even start out with a smaller unit and then add on more units as you need more space.